In this private conference call, Garrett reveals the questions you can use when interviewing a CPA or Tax Professional to make sure you get world-class treatment. And it’s true. As long as you want to live in a society with the advantages it has, you’re going to be paying taxes the rest of your life. There’s no reason to “tip” the government. Yet, that’s what most people do. You see, the government puts you in a tax bracket based on your income. Let’s say yours is the 25% bracket. If you want, you can fill out your tax form and just pay that amount. Uncle Sam won’t care. And if that’s all there was to it, the tax code manual could be about 10 pages long. So what are the other 73,944 pages in the tax code all about? These extra pages describe the deductions and credits you can take, including all the “do’s and don’ts” involved. So while the tax code is long and onerous, it’s actually there to SAVE you tax. Here’s the thing — out of all the financial things you have to keep on top of, taxes are probably the hardest area for YOU to personally be an expert at. This is especially true if you are a business owner. Because roughly 90% of the tax breaks listed in the IRS code only apply to businesses. Side note: This is one reason we recommend W-2 employees have a side business at the bare minimum. There are also strategies to recharacterize some of your regular income as entrepreneurial income so you can take advantage of more tax-saving strategies. Talk to a competent tax professional or inquire here for more info. So unless you enjoy plowing through dense pages of tax code legalese, the TEAM you put together to take care of your accounting and taxes is critical. Why Is This Neglected So Often? So why do so many people NOT have a good tax team? First, while it’s true that no one likes change, sometimes changing your accounting or tax team can be the best thing possible. Especially if you’ve outgrown them. As Garrett talks about on the call, he held on to his first accountant far too long. They were college buddies, after all. But once he got the nerve to break up with this CPA — his friend was actually relieved. He had known for a couple years already that Garrett had outgrown him, and now the pressure was off. 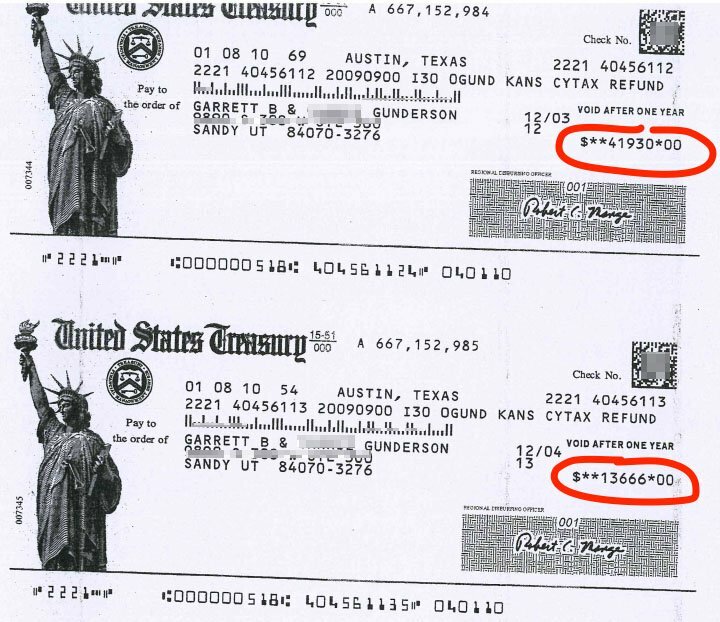 Garrett erroneously “tipped” the government when he didn’t have a good tax team working for him. After adding a world-class team and amending his past returns, he got these checks back. So as far as a good tax professional being too expensive? You see, Garrett didn’t pay his new CPA and tax attorney anything close to $50k — so his return on that “investment” was an initial 10X payoff. And the yearly savings after that have been phenomenal — mainly because he and his CPA meet proactively 4 times a year to discuss tax strategies. A great CPA or tax team never costs you money, it always saves you money. That’s why people like Robert Kiyosaki always say that hiring a great CPA is the best investment they’ve ever made, and gives them their highest return, dollar-for-dollar. So what if you aren’t a high net worth earner? Well — then you may have to be more proactive. Study up on tax strategies that you might be able to use. Take them to your accountant or tax preparer. If they aren’t familiar with a strategy, try to help them raise their game. And if they refuse to help, then it’s time to move on. It’s really more about what their philosophy of money is. And how they approach accounting and taxes. So the real key to finding and hiring a world-class CPA, accountant or tax professional is about asking the right questions. You already know that the person asking questions is always in charge. That’s the position YOU want to be in. Remember — you are the boss. It’s YOUR money. Your CPA is simply an advisor serving you. Hiring a world-class CPA becomes much easier. On the conference call, Garrett gives you 5 important questions to ask your existing CPA or tax professional… or to use if you are looking to add one to your team. In our on-site Wealth Acceleration Workshops, we give you over a dozen questions to ask — but in this free call, he just touches on 5 of these questions. Using them will help give you a really good head start in building out a world-class accounting and tax team. Are you conservative and what does that mean? When does it make sense to pay more in tax? What is the greatest tax shelter? How do you feel about deferring tax and how and if does it make sense to defer taxes? The full answers he gives to these questions can help you totally transform your tax team, keep more of the money you make, and start building wealth the way the ultra-rich have always done it. More importantly, you’ll discover the liberating feeling of knowing you have a world-class financial team supporting you and watching your back (Garrett’s been audited twice and has a net GAIN of $2k from those audits, all because his tax team handled everything). Reducing your tax liability can be one of the quickest and easiest ways to instantly inject new cash flow into their lives. That’s why it’s one of the first things we handle when helping our clients with their personalized Financial Blueprint in our high-level FastTrack program. The next step is to get them plugged into our own word class network of financial professionals — the same team that personally handles Garrett’s finances. And the full team isn’t just for taxes. It includes a comprehensive financial team that works together on your behalf covering every aspect of your financial life, from asset protection to insurance optimization to estate planning to cash flow optimization… and even includes a Registered Investment Advisor.